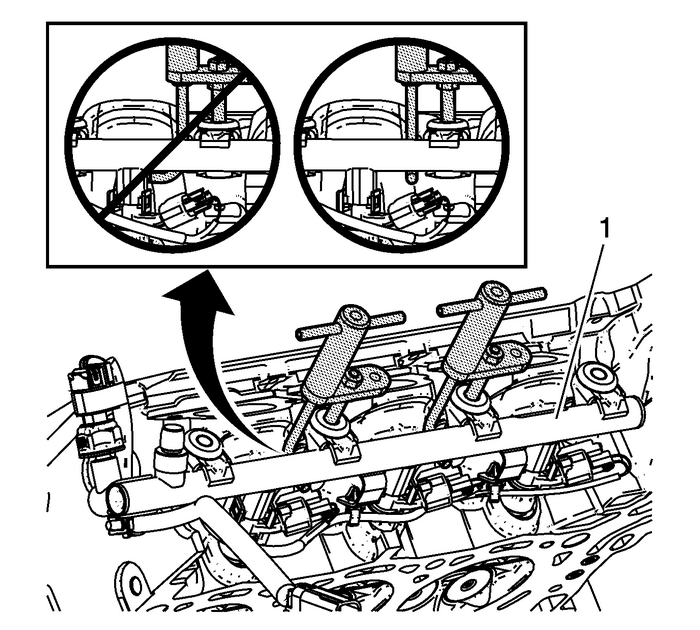 Remove the bolts-(1) from the bank-2 fuel rail.Remove the bank 1 fuel rail and injectors-(2) as an assembly. Refer toCylinder Head Disassemble.Disconnect the bank 1 fuel injector electrical connections. Using the EN-49248-4 hook , raise the fuel rail (1) as an assembly.Once the fuel rail is free, remove the EN-49248 special tool.If the bank 2 fuel rail or injectors are being serviced, remove them. 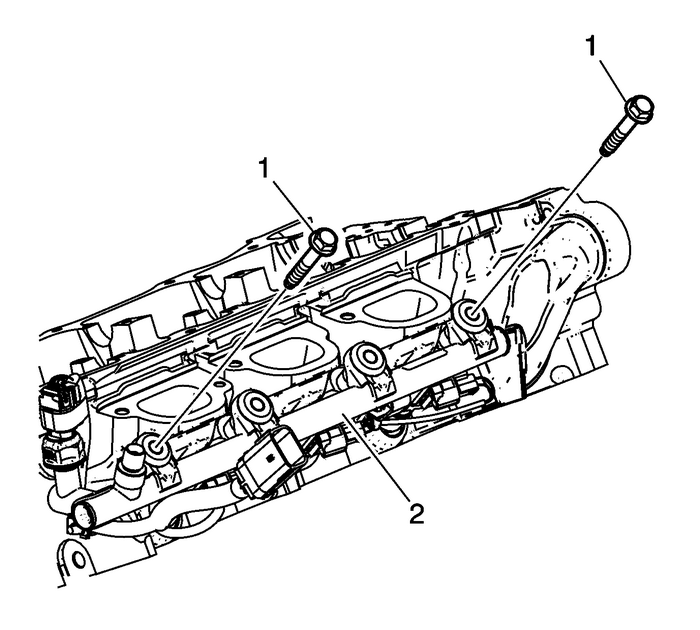 Refer toCylinder Head Disassemble.Disconnect the bank 2 fuel injector and fuel pressure sensor electrical connections. Note:The direct fuel injectors must be rebuilt whenever the injector has been releasedfrom the fuel rail or cylinder head. Clean the fuel injector bores using EN-47909 kit.Ensure that the fuel injectors have been properly rebuilt and lubricated. Refer toFuel Rail and Injectors Cleaning and Inspection.Connect the bank 2 fuel injector and fuel pressure sensor electrical connections.Position the bank 2 fuel rail and evenly hand tighten the 2-outer fuel rail boltsto seat the injectors into the injector bores. Remove the bolts.Connect the bank 1 fuel injector electrical connections.Position the bank 1 fuel rail and evenly hand tighten the 2-outer fuel rail boltsto seat the injectors into the injector bores.Start and hand tighten the remaining fuel rail bolts. Tighten the bank 1 and bank 2 fuel rail bolts to 25-Y (18-lb-ft).Replace any wire harness tie straps cut from the fuel rails.Install the cylinder head. Refer toCylinder Head Replacement - Left Side-or-Cylinder Head Replacement - Right SideInstall the fuel feed intermediate pipe. Refer toFuel Feed Intermediate Pipe Replacement.Inspect for fuel leaks using the following procedure:Turn ON the ignition, with the engine OFF for 2-seconds.Turn OFF the ignition, for 10-seconds.Turn ON the ignition, with the engine OFF.Inspect for fuel leaks. Note:Before installing the foam insulator, remove any remaining fuel from the injectorwell. Install the foam insulator to the fuel rails.Install the intake manifold. Refer toIntake Manifold Replacement.Install the fuel pipe shield. Refer toFuel Pipe Shield Replacement.Install the low side fuel pressure service port cap.